You’ve made it. All of your hard work has paid off. You have been waiting for this for the past 3+ years! As you enter into final year of your High School experience, this year will be among the most memorable you will look back on. After all you’ve worked through to get here, and as you look forward to what will come, we want to take the time to preserve a small portion of these moments and who you are right now. The creative ideas are endless. These images will be forever published in the yearbook, displayed on the walls of your friends and family’s homes, and passed around in albums! By choosing to work with us for your portraits, you know you’re in good hands. We work hard to create portraits that will stand out, stand the test of time, speak for themselves, and capture who you are at this moment in life. We want to make sure you get the highest quality and our professional best. ... our time and creative talent. ... 30-60 amazing portraits to choose from. ... Pre-session planning and preperation meeting. portriats in beautiful Downtown Madison, on Main street Mount Horeb, or the art and grafitti of Willy Street. Capture the beauty of the midwest. This session is for those of us who love the outdoors. 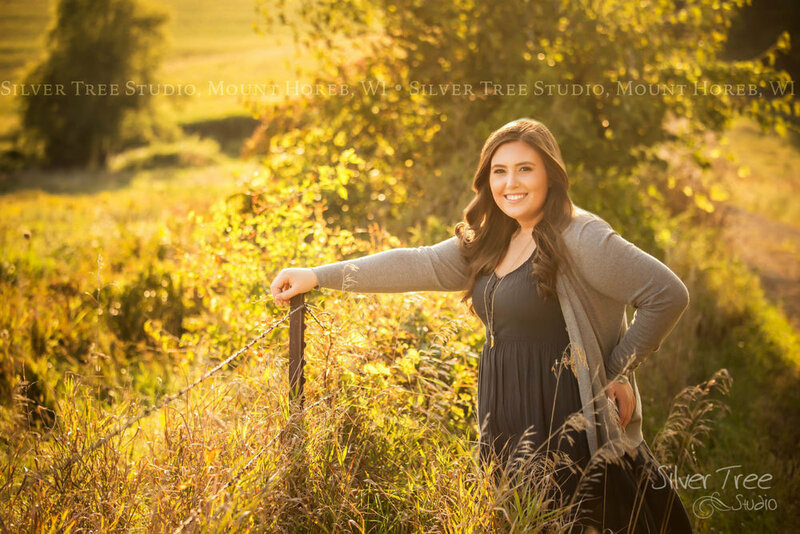 With this session you get 4 hours of our time, unlimited outfits, and up to 2 prairie or rustic style locations. Think creating your portraits in our studio prairie or forest, the family farm, or one of our nearby county parks, etc. This session is our most popular session! With this session you get up to 2 hours of creative time, 5 outfits, portraits in and outdoor at the studio. Keep it simple! This session is perfect if you’re looking for an exceptional portrait without all the fluff. Getting straight to the point, you get 30 minutes of creativetime in the studio and 2 outfits. For the love of the game! You’ve worked hard, sweated, cried, won, lost... the best memories of your school career are created on the field, court, track, ice, diamond, etc. Add this option to your session. Includes a 12 x 18 Metal Print + the matching digital file - perfect for sharing. A best friend is like a four leaf clover, hard to find, lucky to have. Bring your bestie to your session, schedule a second session, either way... let’s get some best friend time! If your best friend books a senior session too... this add on is complimentary. The best answer to this is what time of year you want reflected in your senior portraits. As a helpful guide... we generally use your yearbook deadline, it’s best to book early. July and August are our busiest months. We often book out 4-5 weeks out. Every session includes a design consultation. Before your portrait session, we’ll meet to go over your plans, take a look at the style you want and perhaps take a peek through your inspiration boards. If you love an outfit but you're not sure, bring it along to your session! We'll take a look and discuss if we'll want to use it. Bringing more rather than not enough is always a safe bet. I love the outdoors, but I don't know where to go! Do you? Yes! The studio is located on 10 acres, we have a lot of options. We’re also conveniently located about 10 minutes outside of Mount Horeb, making multiple county parks, the Mount Horeb sports complexes or the beautiful downtown city block easily accessible! What do we do if the weather doesn’t cooperate? We all know how Wisconsin weather goes… if it turns out to be inclement we’ll reschedule. In general, we’ll touch base and make the final call a few hours before your session. That being said… playing in the rain can be fun… bring the umbrellas! How will I know what to do in my pictures? Never fear! ...we’ve been doing this for 10 years, on top of that, we've had numerous hours in continuing education classes and workshops to learn more! We’ve got your back. We’ll guide you through how to pose and explain what we’re thinking. You get to relax and enjoy the session time, it's all about you! Have some fun! I’m so excited!!! When do I get see my pictures? We have found it most beneficial for you to meet 1-2 weeks after your session for your order consultation. At this time, we'll go through your beautiful portraits, choose your favorites and create your portrait collection by following our step-by-step portrait guide. This is the appointment you will create your collection and place your order so it is best to bring anyone who would like to be part of the process with you! Also at this time, we’ll pick your yearbook portrait. We prep the image to your school’s specifications. We even deliver it to your school for free when you place your order. Go ahead and send us your school's yearbook guidelines!